The ban on facilitation payments under the Bribery Act is one of its more controversial elements. The FCPA, the grand daddy of the Bribery Act, permits such payments under a specific exemption (at least in theory). There is no such exemption in the Bribery Act and businesses complain that they will not be able to conduct business without the ability to make facilitation or “grease” payments in some parts of the world. Listening to the debate on the ban on facilitation payments you might think it represents a significant change under English law. It does not. Facilitation payments are illegal under English law today and will be when the Bribery Act comes into force. What is new is the UK Serious Fraud Office’s (SFO) highly publicised zero tolerance approach to them after the coming into force of the Bribery Act in April 2011. We have written about facilitation payments on a number of occasions, most recently here following the comments of Richard Alderman the Director of the SFO. 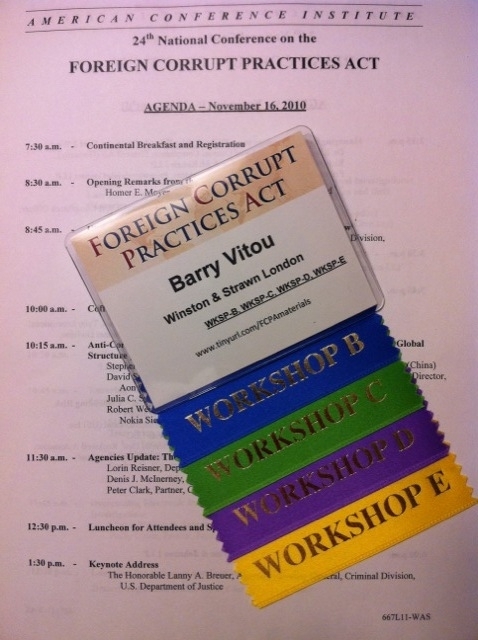 During the FCPA conference in Washington Vivian Robinson QC was asked (again) about the position in relation to facilitation payments. While his comments do not represent a departure from what the SFO has said before they are helpful. Is the making of such payment(s) systemic? Can the organisation show that it has taken steps to curtail the making of such payments. Adding further colour Mr. Robinson said that the SFO was intent on prosecuting the real offenders when considering facilitation payments. He noted that the chances of the SFO seeking to prosecute a corporate before the courts where it can show that it was doing all it could to curtail facilitation payments was unlikely. Responding to another question about what organisations’ policies should be, in particular should policies permit facilitation payments, Mr. Robinson said that the defence of “Adequate Procedures” to prevent bribery is relevant to the exercise of the SFO’s discretion in deciding whether or not to prosecute. It is very hard to see how the defence of “Adequate Procedures” is made out if a company policy permits the making of illegal payments. The nub of this is that organisations should ensure that their policies ban the making of facilitation payments and make every effort to stamp them out. If they do this Mr. Robinson said that it would be unlikely they would be prosecuted before the courts. We strongly recommend companies do not make facilitation payments. 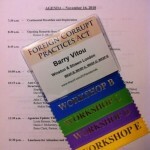 They are illegal and any contract obtained through the making of a facilitation payment will represent criminal proceeds (for more information read our guest post on theFCPAblog.com “Don’t get POCA’d”). In other words a corporate risks that the value of the entire contract (not just the profits from it) being subject to confiscation under UK money laundering laws and that any such contract is at risk of being found unenforceable through English contract law principles of illegality. We also strongly recommend compliance with the law instead of an approach which relies on subjective prosecutorial discretion. The SFO is not the only prosecutor. The UK Crown Prosecution Service may also prosecute and to date it has been silent on the approach it intends to take.